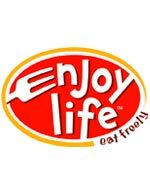 "At Enjoy Life, our whole business is making smile-good foods that keep people’s insides happy. That’s why all of our foods are specially made to be gluten-free and free of the 8 most common allergens. Our goal is to make delicious products that just about everyone can EAT FREELY. We promise they’ll make you smile inside out!" "We have NEW and IMPROVED granolas! Now crispier than before with smaller granola clusters, our granolas look and taste more like the “real” thing. Vitamin fortified and with 23 grams or more of whole grain per serving. They're a nutritious and delicious start to your day." "Make your own blondies with our semi-sweet chocolate mega chunks that are dairy- , soy- and gluten-free!" 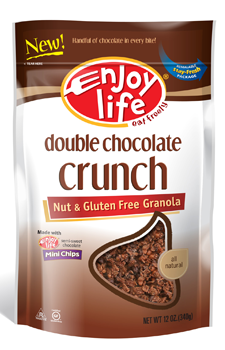 What we thought: Enjoy Life Foods has a variety of goodies that can help you create a healthy, gluten-free diet that isn't lacking in flavor. We really enjoyed the double-crunch chocolate granola. It was a great snack and definitely satisfied our chocolate craving:) The mega chunks were wonderful in chocolate chip, or shall I say "chunk" cookies:) The big pieces of chocolate mixed right into the batter with ease and baked to a sweet, melty perfection of a cookie:) Mmmm...I think I'll go have some cookies and milk right now:) Seriously though, even the members of the family who didn't know these were gluten-free thought they tasted great:) If you are looking for some sweetness in your gluten-free diet and you don't want to sacrifice taste, check out the variety of goodies at Enjoy Life Foods. ABCD Diaries gives Enjoy Life Foods an A+! Buy It: You can find these fantastic Kashi foods at grocers and mass merchandisers nationwide.